An oldie but still goodie: ice + salt = frost. But where does it come from? This first science activity is super-simple and super-fun. Get a metal can and fill it halfway with ice (a drinking glass or beaker would also work). Add a generous amount of salt and have a 6th grader stir it for a minute or two. You’ll soon see water droplets form on the outside of the can, and soon after that you’ll notice those droplets turn into frost. What’s causing that? When you mix ice plus salt the temperature drops to about -20 degrees F (-29 C). Imagine that you are a tiny water vapor molecule (high energy gas) happily flying around in the air… until you bump into this extremely cold can. When that happens you lose energy and drop down in state from gas to a liquid. That means that you can no longer fly. You and a bunch of other water molecules are packed in together (ew), but at least you can move around each other. These are the liquid droplets you saw. Since you’re now stuck on the can, you keep losing energy until you and the other molecules can’t even move around each other any more. You’re now what we call frost, which is solid water. Feel tired? If you’re feeling brave you can have a few 6th graders that you trust to walk randomly around the room to illustrate what gases do. Then have them clump up in the middle of the room and slip/slide around each other to illustrate liquids. Finally, have them stand still in a cluster to illustrate solids. Silly but nearly unforgettable. A bubble floating on CO2. Impossible, until you know what’s going on. Pour some vinegar in a beaker and then add a spoonful of it’s best friend- baking soda. When it’s done fizzing try your hand at bubble basketball; that’s where you try to blow bubbles into the beaker. It’s tricky, but if you succeed you’re 6th graders will see something that looks impossible- a bubble floating in mid-air! How is this possible? 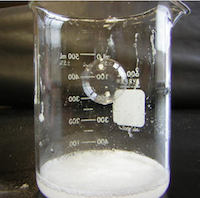 The vinegar + baking soda chemical reaction produced CO2 gas, which is heavier than air, so the carbon dioxide just stayed in the beaker. The bubble is lighter than the CO2 so it sits on that bed of CO2. As they say- science is magic. A charged balloon attracts a ping pong ball. An easy sixth grade science activity. 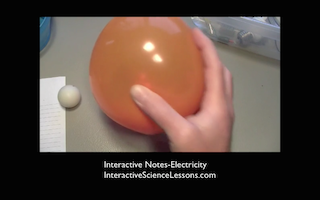 All you need for this sixth grade science activity is a ping pong ball and a balloon (have you noticed the best science activities use simple materials?). Inflate the balloon then fill it with static electricity from the hair of a sixth grader who was having a good hair day till now. Bring that charged spot up to the ping pong ball and have your sixth graders observe what happens. They’ll be puzzled by what they see. The ball comes towards the balloon. But why? It’s all caused by the static electricity, which are electrons. The negative charges on those electrons attract the positively-charged protons in the ping pong ball. Wow! 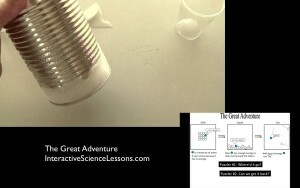 Below are LOTS more cool science activities you can do with your students.